Updated: MP’s Ryedale meeting hears demands for halt to fracking – DRILL OR DROP? 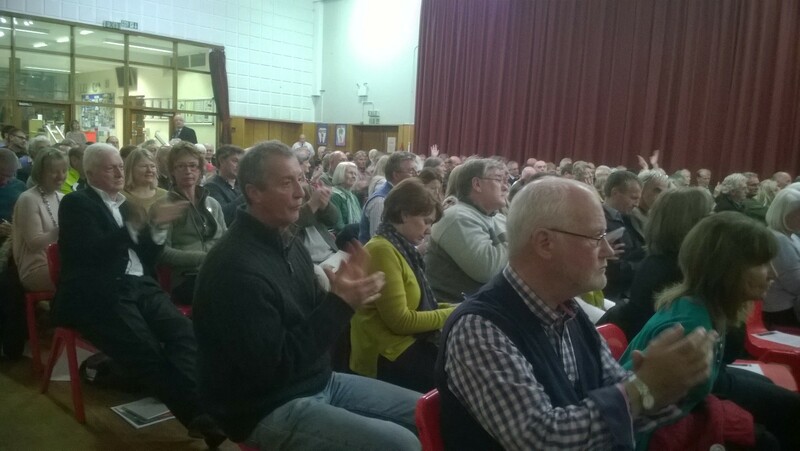 A bad—tempered meeting of 250 people in the North Yorkshire market town of Malton last night questioned the need and the desirability of fracking. The meeting, organised by the Thirsk and Malton MP, Kevin Hollinrake, heard repeated calls to put on hold Third Energy’s plan to frack at nearby Kirby Misperton. One woman said on her way out: “That’s the best argument I’ve heard so far for a moratorium”. At times verging on chaos, the meeting heard allegations that local people were being used as guinea pigs in a fracking experiment and that the area was a “sacrificial lamb to corporate greed”. Mr Hollinrake, interrupted after just two minutes, occasionally struggled to keep order. Another questioner referred to bankruptcies among US shale companies and the predicted higher costs of extracting shale in the UK. The meeting, open only to local people, heard from representatives of the Oil and Gas Authority, the Government’s Office of Unconventional Gas and Oil (OUGO), Public Health England, the British Geological Survey, Health and Safety Executive and the Environment Agency. Not all the audience was opposed to fracking. The spokesperson for Friends of Ryedale Gas Exploration, Lorraine Allanson, was in the audience. But all the questions were either sceptical about fracking or hostile. And the audience was uncompromising about many responses from the panel. When Mr Hollinrake repeated his call for a five-year strategic shale plan for Ryedale, some complained that this wouldn’t be ready in time for a decision on Third Energy’s plan to frack the KM8 well at Kirby Misperton. Mr Hollinrake said KM8 was about “taking the next step and reviewing the implications of shale gas in the UK.” But some people shouted back: “It starts with just one well”. Mr Hollinrake said he believed shale gas was a bridge to a low carbon future. But a questioner asked how he could reconcile tackling climate change with an entirely new fossil fuel industry that was, in his words, being developed under “the spurious and specious guise of energy security”. One questioner asked what Ryedale and the UK would be like if thousands of wells were drilled. “What good is that?”, someone shouted from the audience. “Because that is the best way to regulate, on a site by site basis, rather than hypothesis about what might happen”, Mr Christmas replied. “I am not in charge of the public planning for Ryedale” he said. He repeated his view that ten new sites that Third Energy had said it needed in Ryedale could be found in the district. “What about other operators?”, someone shouted from the audience. “Rubbish”, someone shouted from the audience. “Yes or no”, asked the questioner”. After a pause, Professor Ward said: “I cannot answer that question because I have not read in detail the planning application”. “Yes and I already have”, Mr Hollinrake said. The audience appeared sceptical about what would happen if fracking companies went bust before wells were abandoned and sites restored. There was criticism of lower tax rates for the onshore oil and gas industry and cuts in research and development for renewable energy and energy conservation. There was also an apparent lack of trust in the regulators. When Mr Hollinrake asked the audience if it believed the Environment Agency was independent, many people shouted “No”. After the meeting, some people described it as “bad-tempered”, chaotic and “a shambles”. “We were told at the meeting that should this hugely damaging industry be allowed to come to Ryedale it will be effectively self-regulating, so what faith can the public have in the regulators – it is like asking students to mark their own exam papers”. Mr Hollinrake disagreed that the meeting had been bad-tempered. He said: “People who turn out on a rainy Monday evening are likely to have real worries.” He said some people would not change their minds but he was glad he had organised the meeting. I was delighted and encouraged that there was a huge turn-out of constituents who were keen to know how Ryedale and its residents will be safeguarded with regard to Hydraulic Fracturing in Ryedale. Kevin Hollinrake has certainly worked hard to discover the truth about Hydraulic Fracturing. After last night event I know we can all be reassured that Ryedale is being safe guarded like no other time in history and all eyes will be watching the industry as it develops. Also last night, Dr Mariann Lloyd-Smith, of the Australian organisation the National Toxic Network, spoke to a meeting in Kirby Misperton. Updated on 14/10/15 to include comments from Kevin Hollinrake and Lorraine Allanson. MP Kevin Hollinrake needs to realise that he was elected to represent his constituents in Westminster, NOT to represent Westminster to his constituents! Sounds to me as though Mr Hollinrake is an excellent representative for Third Energy et al. It sounds like some people need to learn some manners. In a public meeting is it acceptable for people to shout and deliberately try to wind up the speakers? They are specialists in their subjects and need to be allowed to speak and be respected. That attitude that some seem to be trying to create is that this is a plan to make Tory boys rich, while killing off the common people. Bizarrely enough, one of the leaders of the anti groups does beleive this! Conspiracy theory specialist Ian R Crane. Do people really beleive that the Environment Agency would permit that? Kevin Hollinrakes visit showed that there are few issues, and most of those are historical, and there are very positive aspects to this. Friends of the Earth are going to be taken to task for their deliberate disinformation, to the Charity Commission, the Advertising Standards Authority, and the Fund Raising Standards Board, as they are spreading information that has no scientific basis. Cuadrilla may well be able to sue them. Thats the same false information that people are beleiving. This has been looked at by specialists and its all safe. Thats why so many independent bodies have found no issue with it, such as the Royal Academy of Engineering. and concerns about contamination of the water aquifers. But these have all been looked at are of no issue. It will be a green completion almost everywhere, the well will be tested into the gas grid. No leaks at all. It is a licence condition that there will be no leaks. and concerns about contamination of the water aquifers. But there is a lot of evidence out there not from FOE! Again these studies are of very low reliablity. There is not a single study that has been accepted by the health authorities in the US as good data. They use small sample size, or unreliable evidence. In many cases they ignore and remove results that do not fit their ‘desired outcome’. They are financaed by anti carbon funding, and are done by activists. The chemicals that are of concern are not permitted in the UK under any circumstances. They have to be ‘non hazardous’ and BTEX etc are all on the ‘hazardous’ list. It really is not an issue. Of course the specialists there would happily have explained this, had they been given the chance! Why do you not want people to know who you are? Please look at CHPNY & PSR websites. 500 peer reviewed studies in USA all agree that there are risks to health and climate change. There are letters from Physicians for Social Responsibility of Maryland Pennsylvannia and New York asking for meeting with their Govenors to talk about all the problems they have had. These are not things that may happen but have happened. And if you say that regulations are better here how come Quadrilla got away with dumping contaminated water into the Manchester Ship Canal and all they faced was a fine. They should have been prosecuted. Oh, and I forgot, health has improved in the US due to fracking. All of the major air pollutants have reduced, as shale gas has replaced the genuinly concerning coal, in the generation of electricity. 1600 a year are reckoned to die in the UK due to coal polltions. That would reduce to zero with shale gas. Time to get real and accept that what keeps us warm in a cold and dark winter comes from our exploitation of resources available to us.The challenge we must rise to is how to commercially extract the available resource with the minimum impact. Hydraulic fracture stimulation is a well proven technique in our toolbox that enables us to reap the benefits provided by natural gas. Tearing up floor boards and burning them through the winter is also an option. However at the end of the winter the cost of repairing the floorboards outstrips the value of the heat provided. Fracking is much the same excepting with fracking some Texas based outfit like Halliburton would remove the floorboards and sell them back to the householder whose house they have just wrecked.